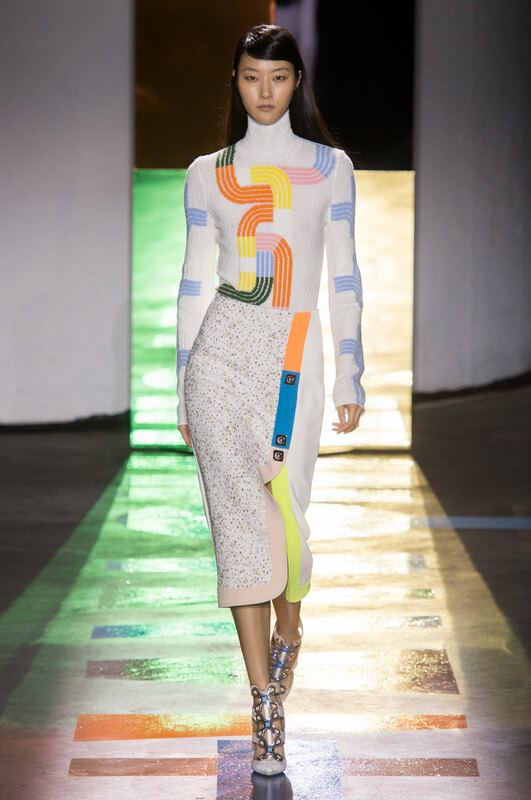 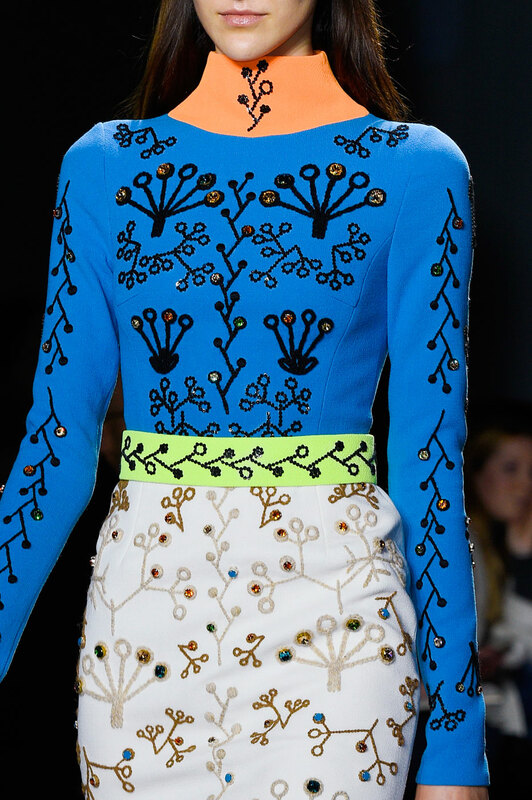 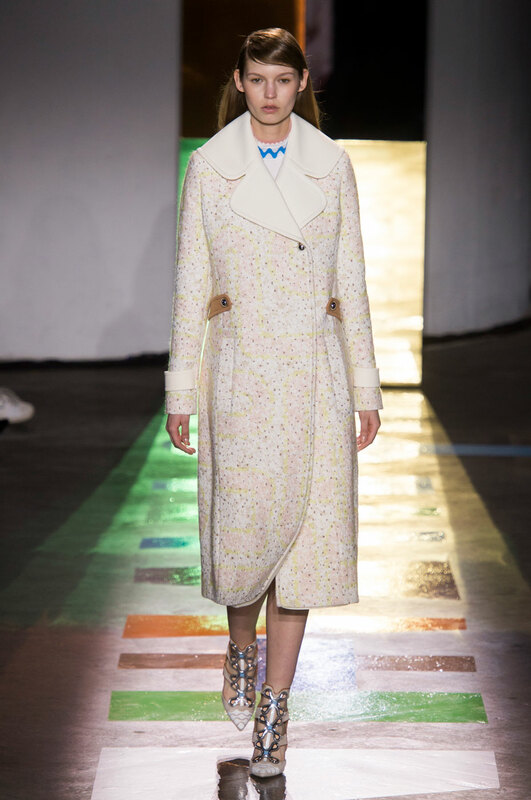 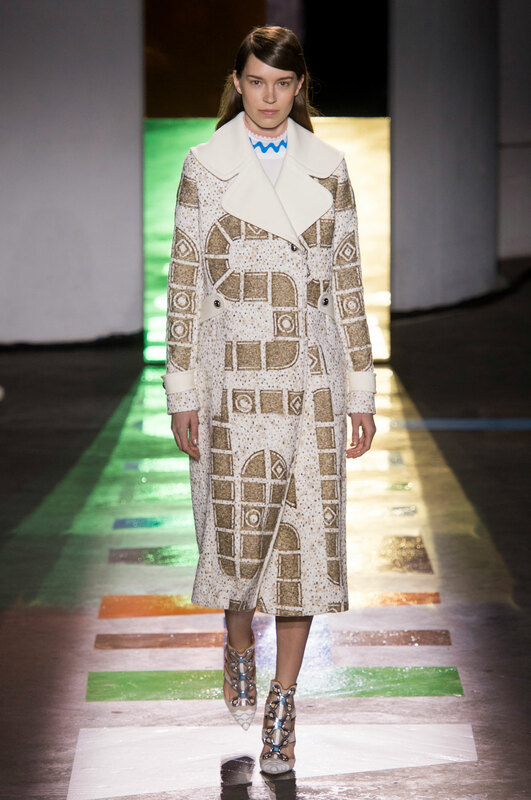 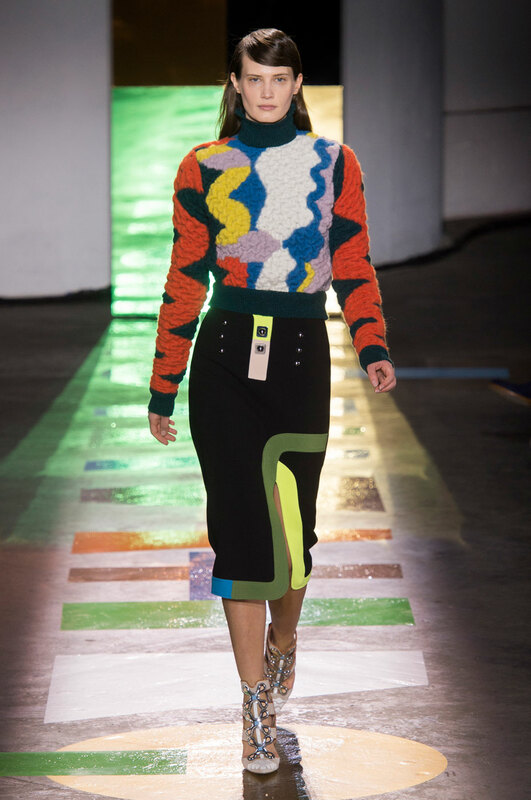 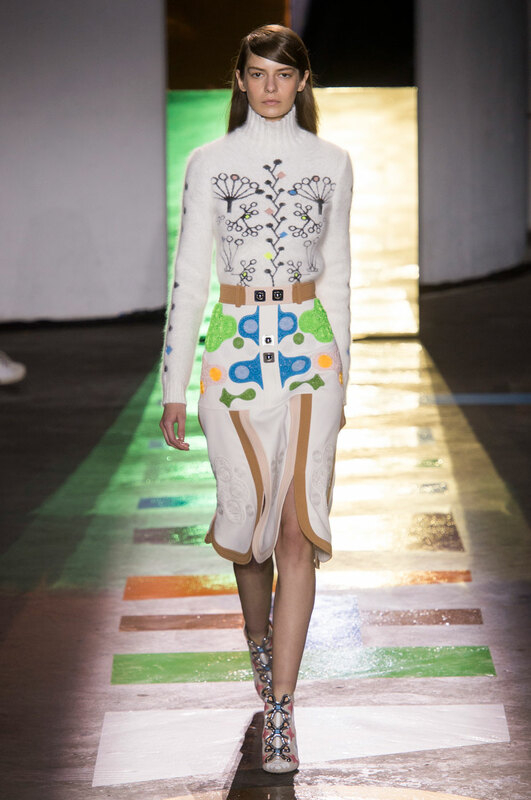 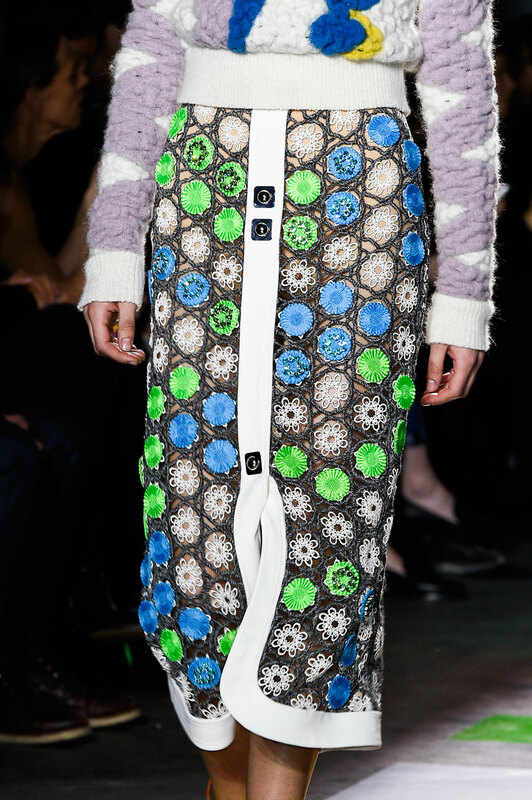 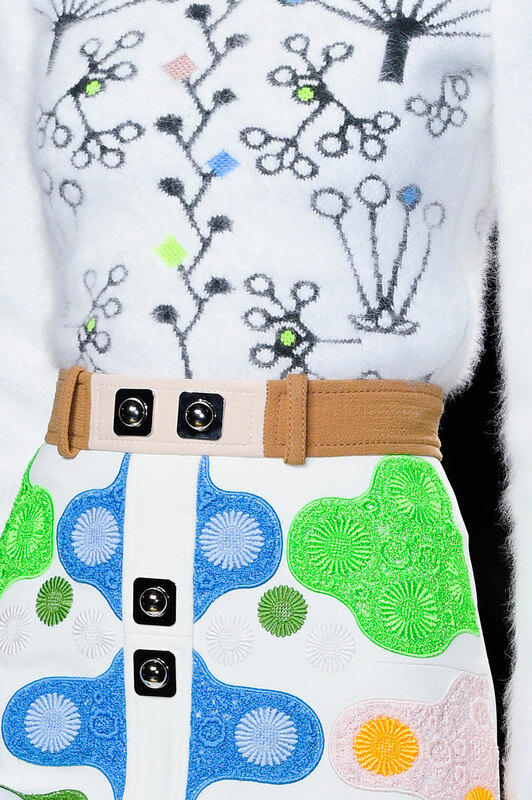 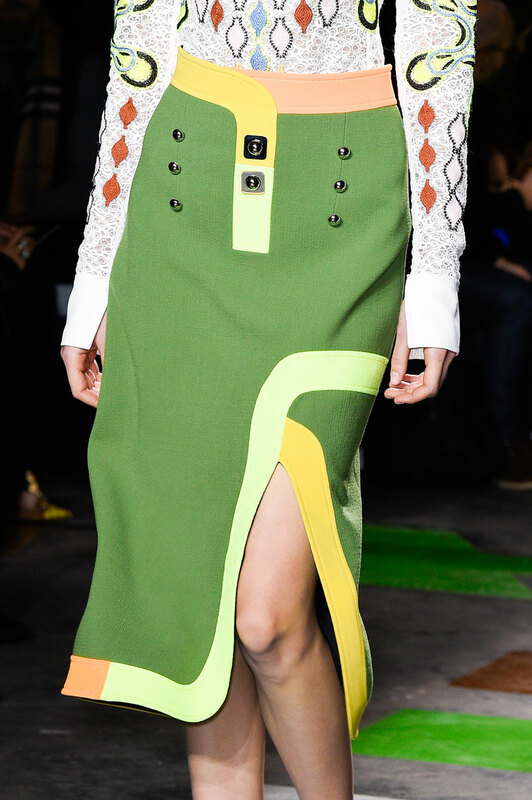 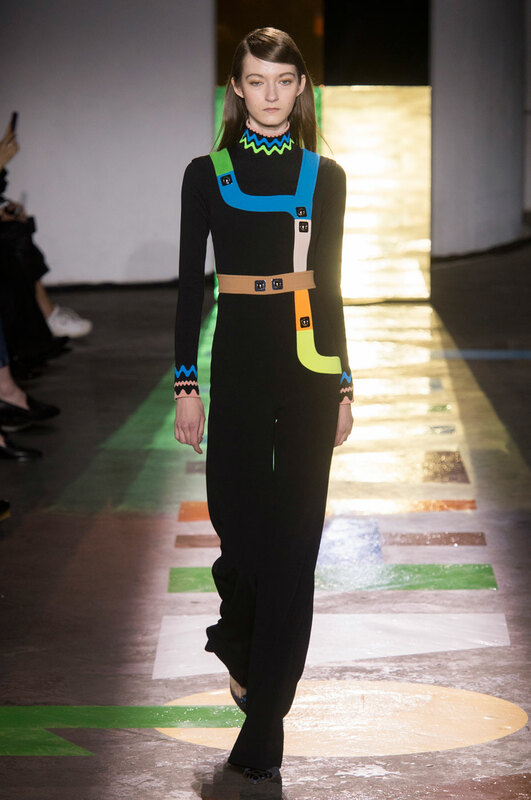 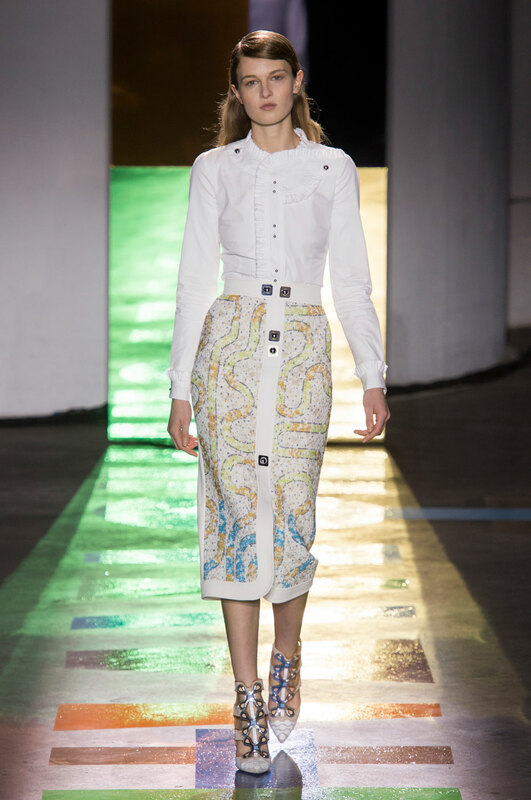 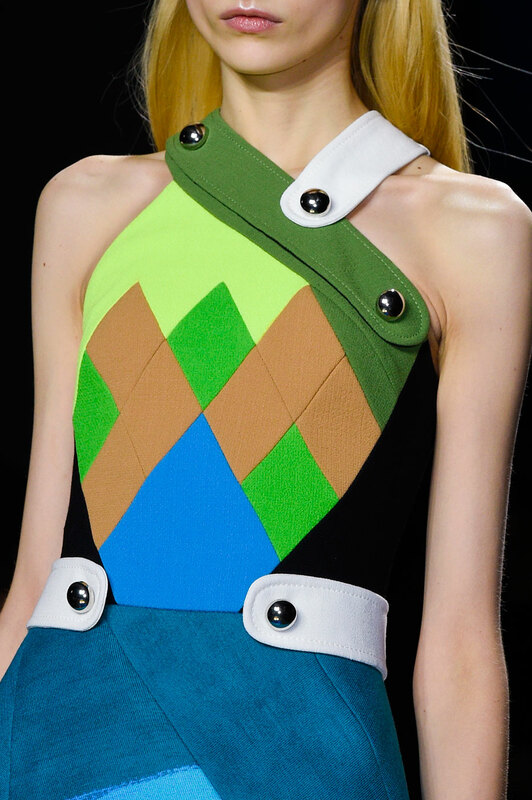 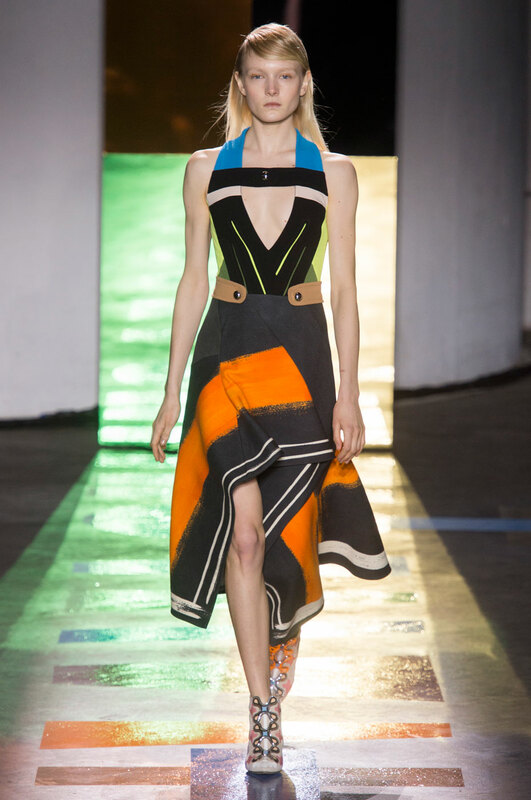 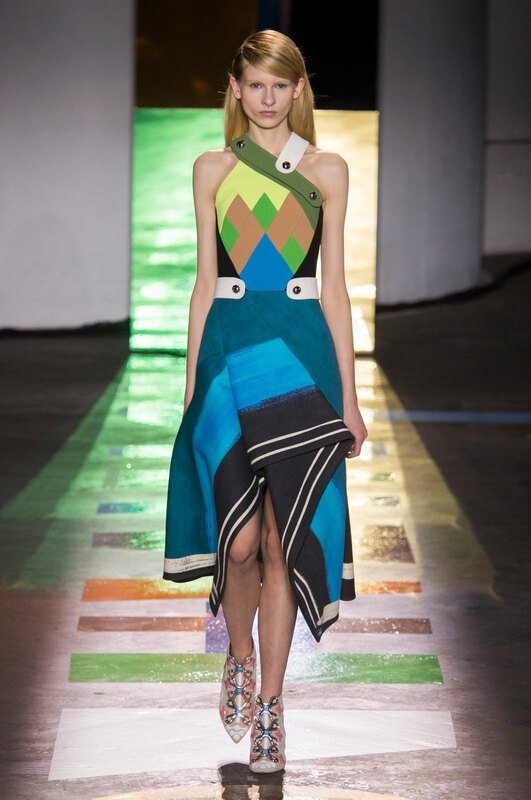 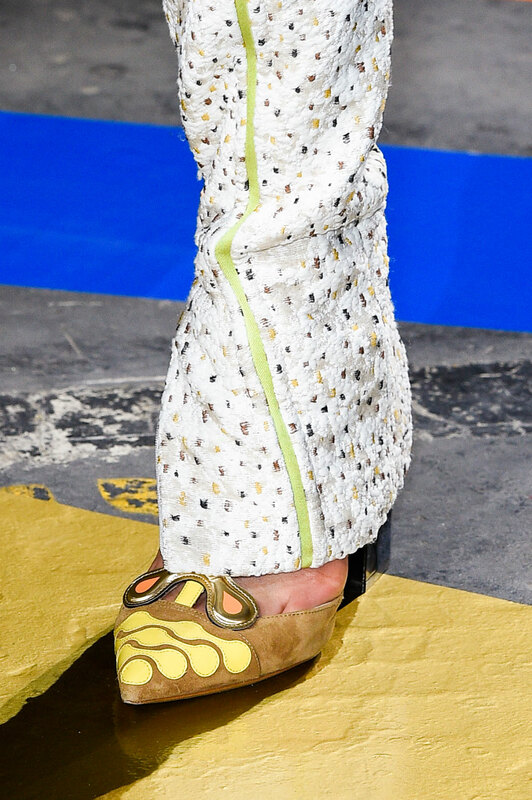 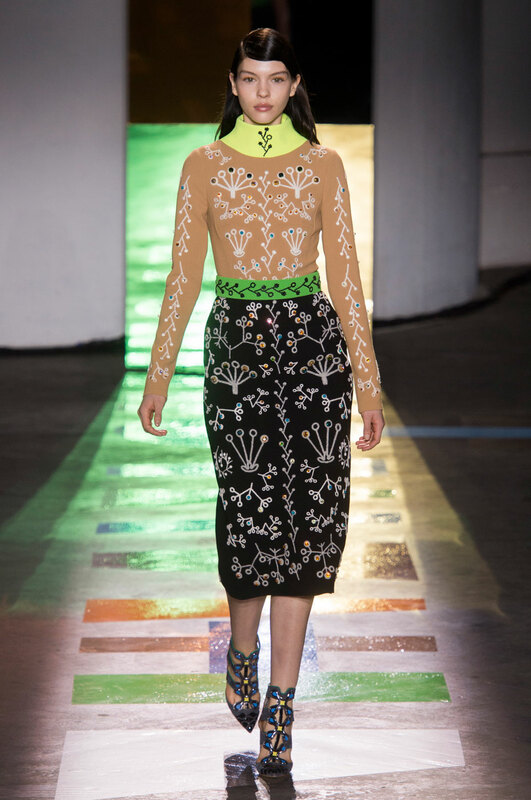 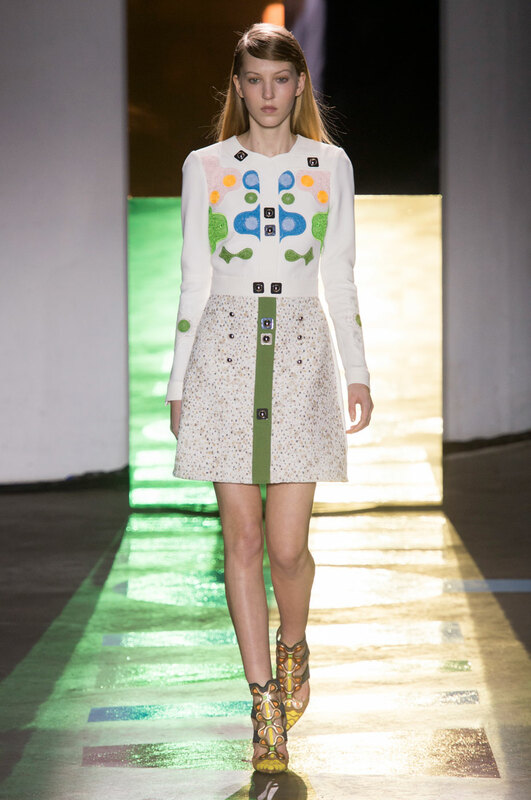 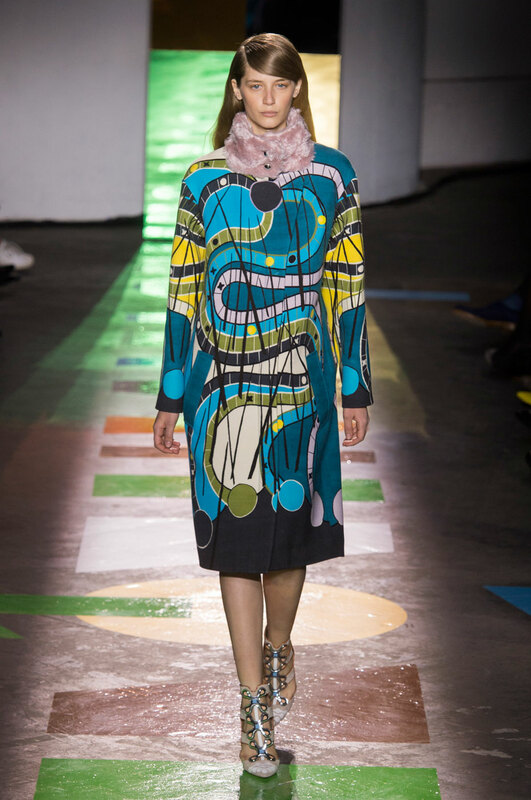 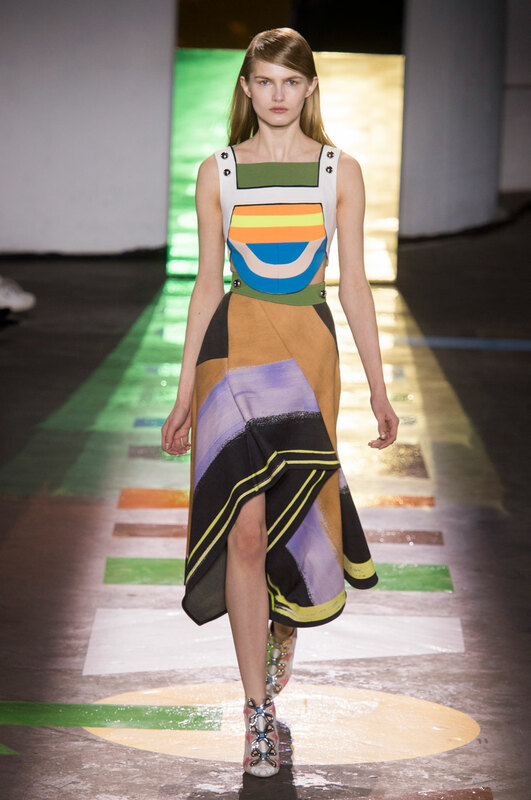 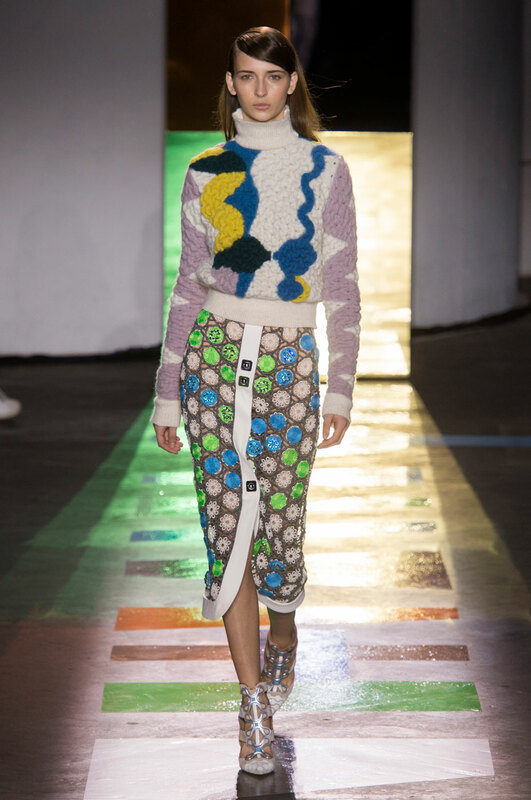 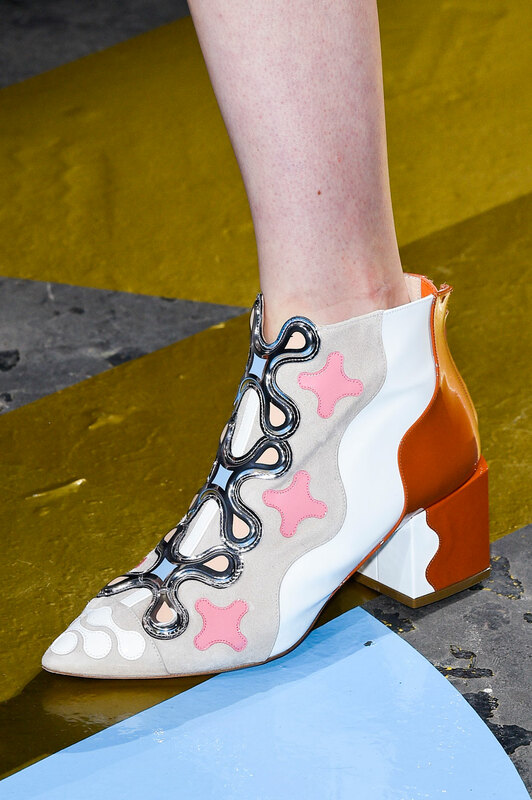 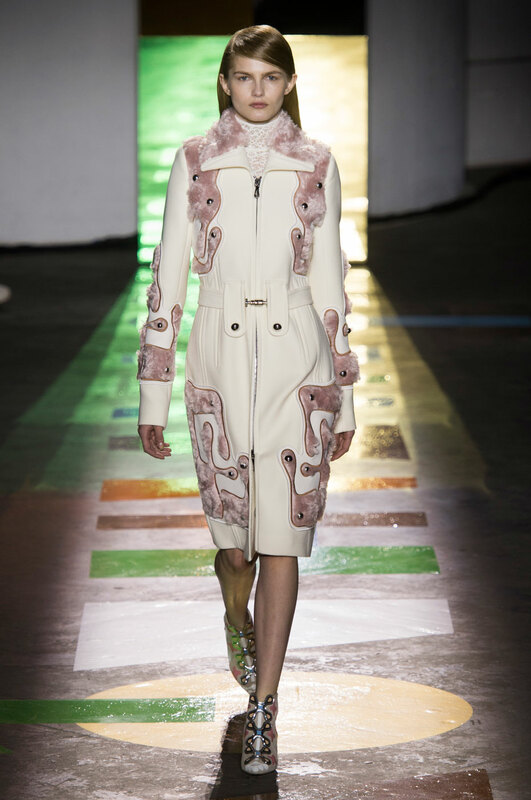 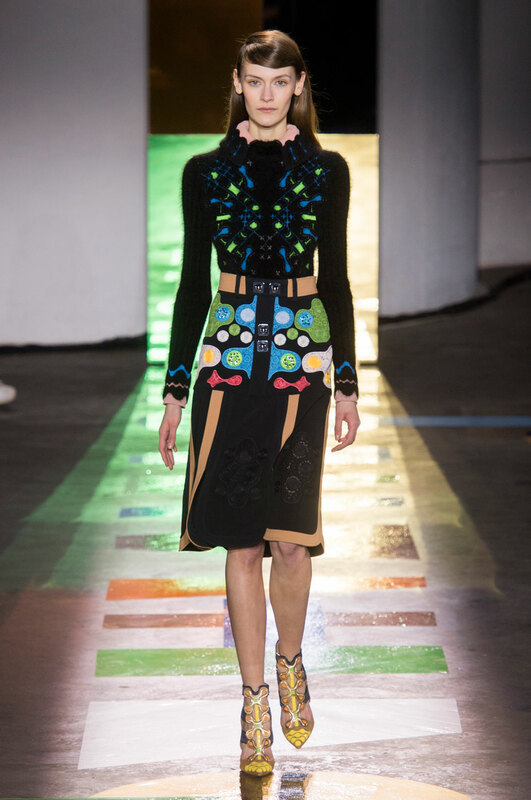 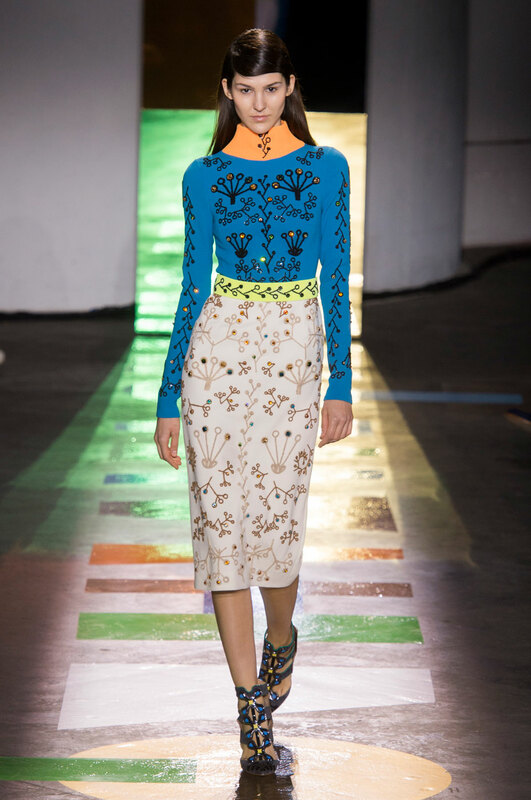 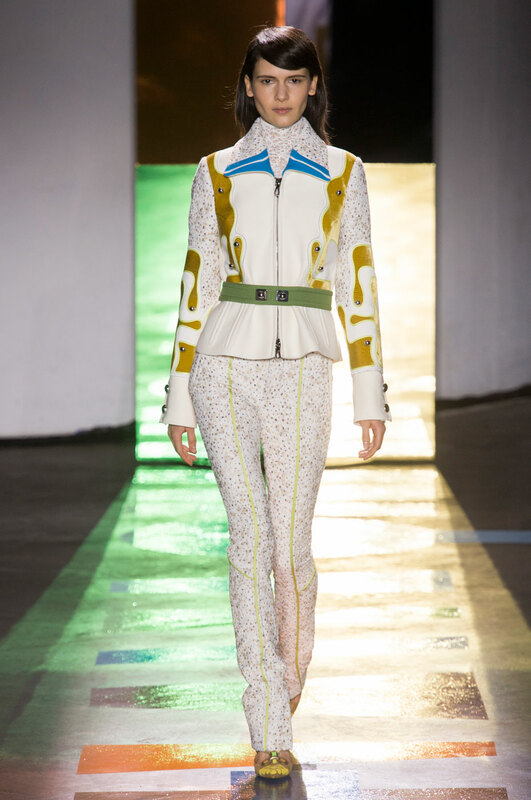 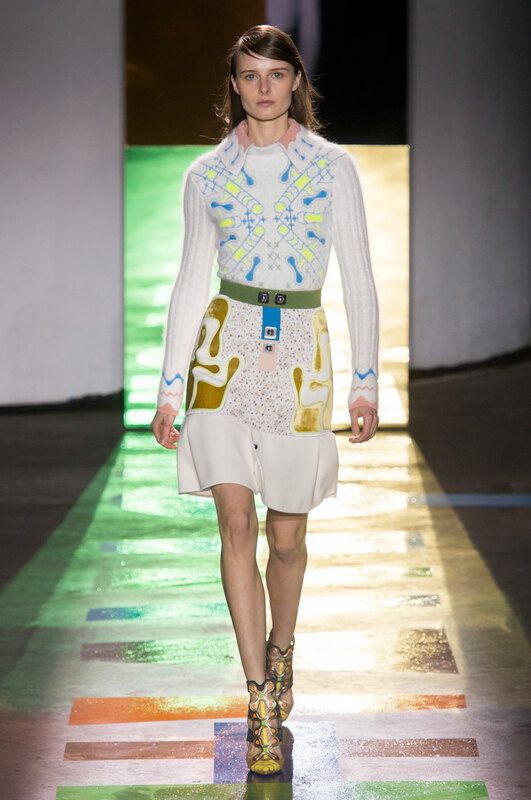 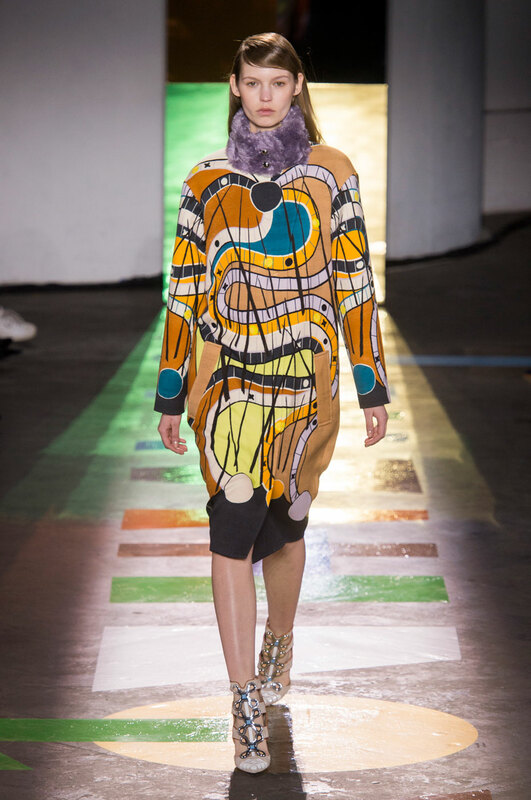 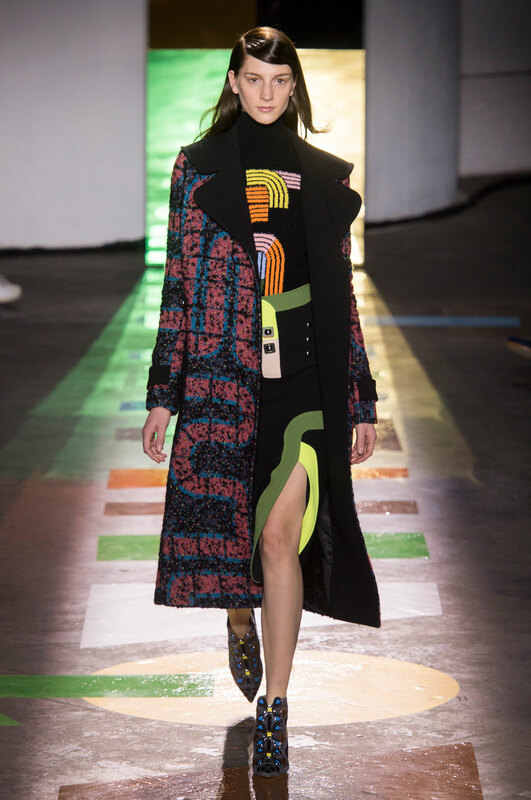 Peter Pilotto Women Autumn-Winter 2015 - Propositioning Autumn and Winter with lots of fun and adventure, Peter Pilotto’s show notes revealed this year’s collection has been inspired by the board games Snakes and Ladders, Ludo and Connect Four. 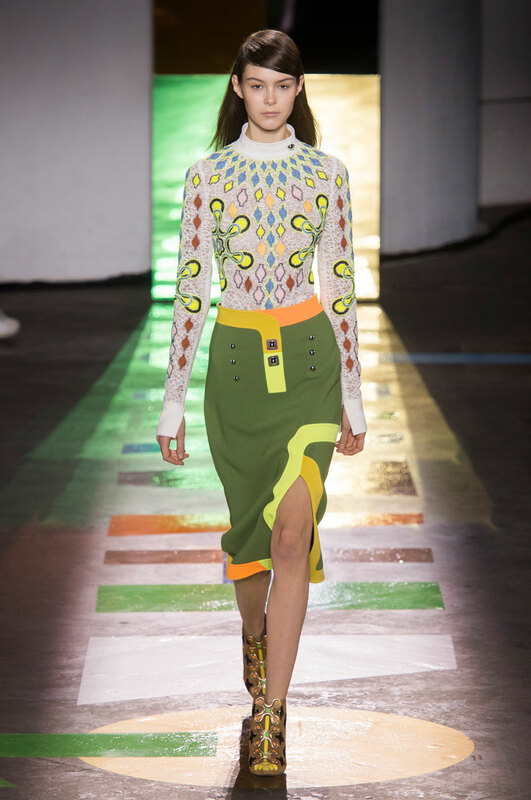 With fluorescent neon accents included throughout the collection, psychedelic vibes began to arise as the brightness of oranges, moss greens and blues elegantly clashed against a governing scheme of crisp winter white. 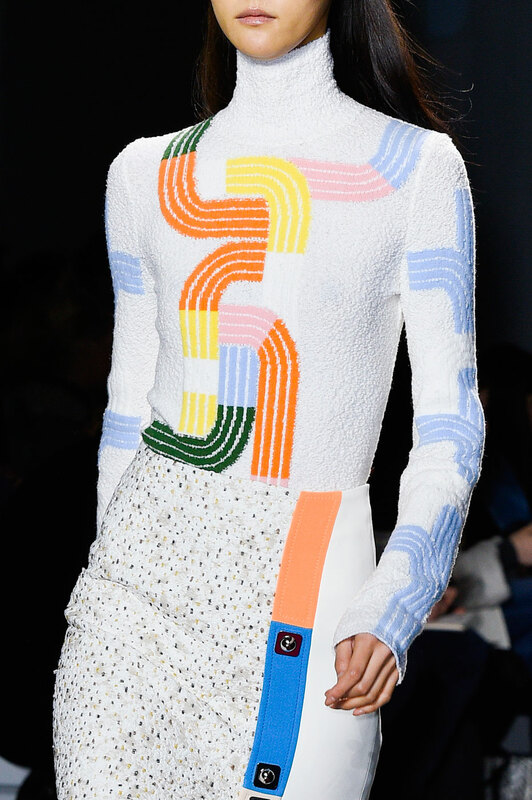 Whilst many of the designs featured what appeared to be vividly coloured shapes of varying colours and sizes, upon closer inspection those shapes turned out to be embroidered pieces of Scalextric tracks. 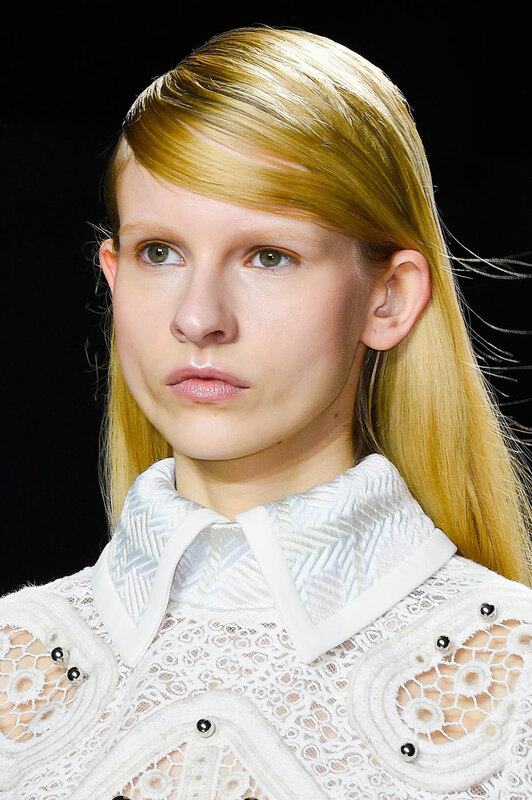 But the game aspect did not simply stop there, with the heavy sweeps, ear tucks and severe side partings of model’s hair being used to represent the sharp twists and turns of a child’s racing car track. 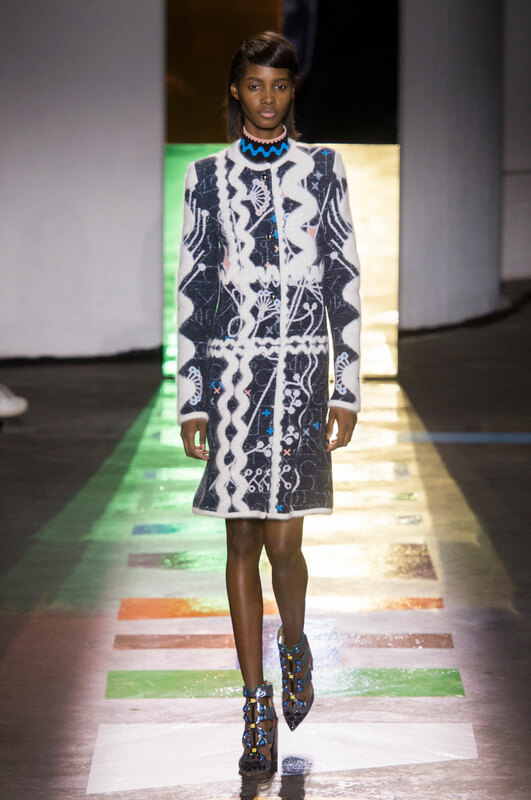 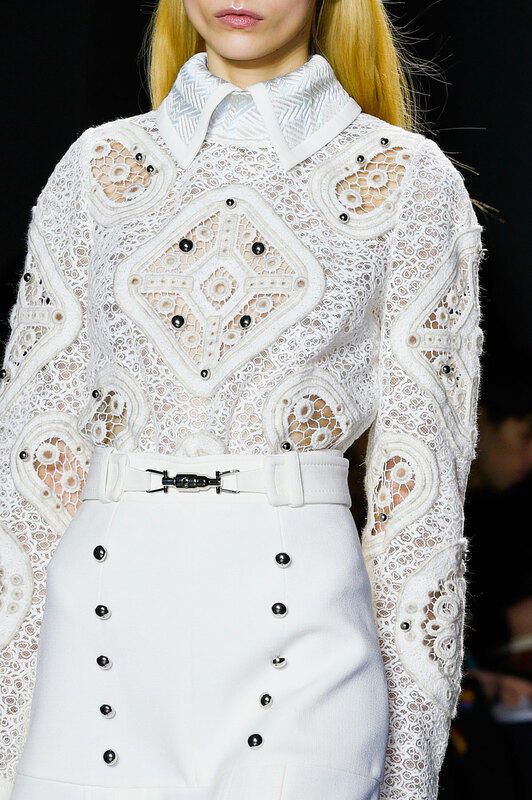 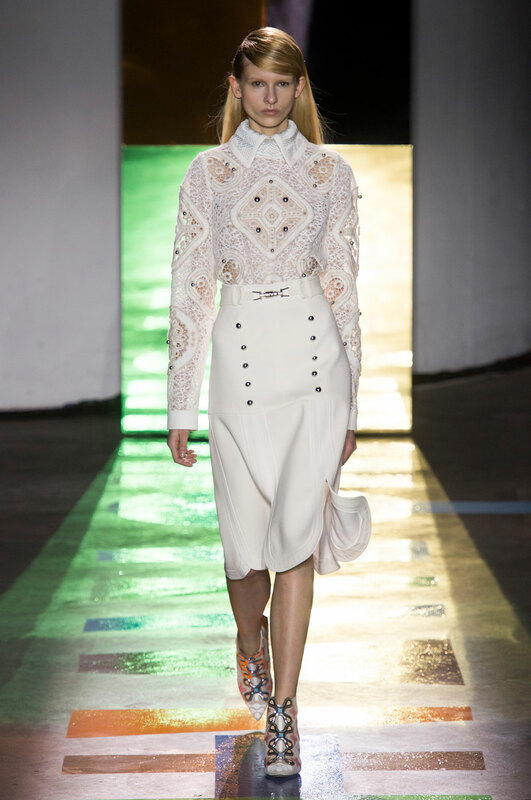 Alongside trademark geometrics and colour pop prints, the brand’s initial looks in pure whites projected a traditional view of elegance with hems remaining asymmetric and coats bearing intricate detailing and spots of sequins within their fur. 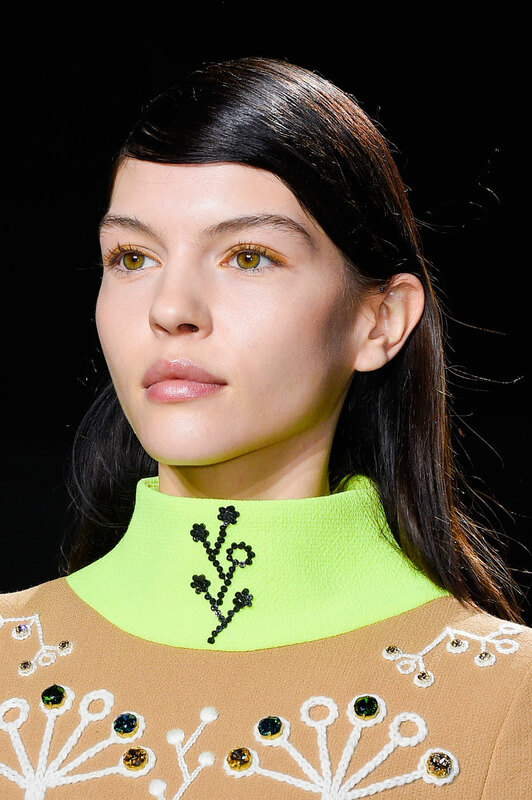 Away from game inspired prints, floral crocheting reinforced ideas of youth and femininity whilst the embroidery of elderflowers onto several outfits ensured that some of the clothing remained demure.